Tired of finding fallen strands of hair on pillows and the floor? It sure can put you in an embarrassing situation. If you want to get rid of the receding hair line and thinning hair condition then it’s important that you look skin deep. When your hair needs extra nourishment, topical treatments alone will not give you significant results. Biotin supplements are creating a lot of buzz for their amazing hair benefits, but do they actually work. Let’s review DasGro Hair Growth Vitamins with Biotin and DHT, a popular Biotin supplement for hair growth. DasGro Hair Growth is formulated by Pure Results Nutrition, a company that strives hard to bring the best quality supplements to their customers. They make extra efforts to ensure that each supplement offered by them is made in the USA and they follow the strictest manufacturing guidelines. Their products are not only made from natural and safe ingredients, but they also offer the best in quality and services. What I like best about DasGro is that unlike topical shampoos and serums, it works from within to treat the root cause of the problem. It contains an amazing blend of FDA-approved vitamins and nutrients that are put together to formulate an effective treatment for hair loss. Each ingredient has been chosen carefully to make DasGro a powerful product to fight against hair loss. DasGro does not contain filler ingredients. Instead it’s packed with powerful herbs, vitamins, and nutrients that add value to the product. The product is made in the USA and the facilities follow the strictest guidelines to ensure that quality is never compromised. Receding hairline or thinning of hair could be due to an underlying health condition or deficiencies within the body. Lack of adequate nutrients also causes weakening of the hair follicles, premature graying of hair, etc. When you consume DasGro on a daily basis, your body gets a continuous flow of vitamins and nutrients that slowly promotes healing and encourages hair growth. Sometimes it is difficult to get the required amount of nutrition from your daily diet. This is when you need something ‘extra’ and this is where DasGro comes into the picture. This is a natural hair loss treatment with DHT blockers which means it can address vitamin deficiencies leading to pattern baldness in men and women. MSM or methylsulfonylmethane, is a sulfur-based compound which occurs naturally in foods like onions, garlic, milk and green vegetables. It is one of the main building blocks of hair. Studies have shown that it encourages hair growth. Saw Palmetto is a palm-like plant with several health benefits and fighting hair loss is one of them. 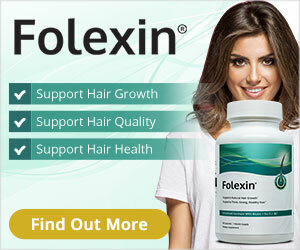 It is made up of components that can be found in hair growth pharmaceuticals. Ginkgo Biloba is an herbal supplement that improves blood circulation to the scalp to make your hair grow healthier and thicker. It is considered an effective inhibitor of DHT which is known for blocking the hair follicles and preventing growth. Green Tea contains catechins which prevent the formation of DHT or dihydrotestosterone, which is the main reason behind male baldness. Grape Seed Extract is rich in linoleic acid, flavonoids, Vitamin E and OPCs or oligomeric proanthocyanidins that are known to stop hair loss and promote hair growth. 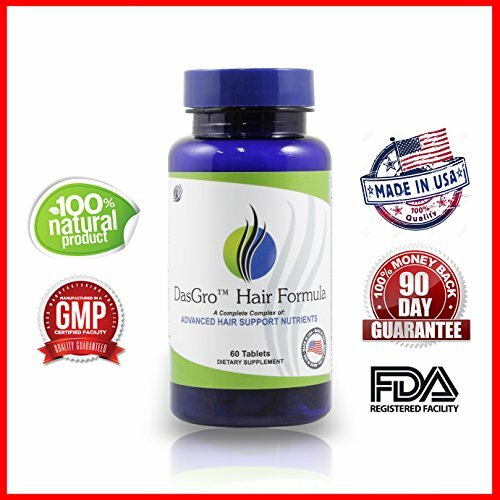 DasGro is a 100% natural hair growth supplement. It contains no preservatives and no fillers. It is gluten-free and made in an FDA approved facility following the highest standards. The DasGro Hair Formula comes with a 100% money back guarantee. If you are not satisfied with the results, you can return the product and ask for a full refund. This is a risk-free purchase. DasGro hair growth formula is slightly more expensive than other hair growth products available on the market. DasGro hair growth supplement contains an effective list of natural ingredients that are known for their ability to prevent hair loss. The product can be used by anybody who’s experiencing hair thinning or hair loss. It comes with a money back guarantee that makes it a good buy!